Abstract: Every day, people all over the world leave their homes in search of a better life. On the road, many go missing. The mandate of the International Committee of the Red Cross (ICRC) to protect the lives and dignity of victims of armed conflict and other situations of violence includes, in certain contexts, protection of vulnerable migrants. The ICRC missing migrants pilot project aims to locate or clarify the fate of Zimbabwean migrants who went missing in South Africa, on behalf of their families. The ICRC aims to work with South African and Zimbabwean authorities to support and enhance existing systems, tools and resources used for locating missing relatives, living or dead. Additionally, the ICRC carries out and supports the activities of National Red Cross and Red Crescent Societies in the region to restore contact between and where possible reunify family members, in particular children, who have been separated by conflict, migration, displacement or natural or man-made disasters.The Review has chosen to open this issue with the stories of family members of missing migrants in Zimbabwe. The section aims to show the everyday struggle, sometimes lasting for many years, of those that live with continuous uncertainty regarding the fate and whereabouts of their loved ones. As a result of the disappearances associated with migration, families searching for missing relatives often face a range of needs and challenges. These persons chose to share their life stories with the Review, allowing our readers to understand the intricate balance of uncertainty, hope and the “need to know” that family members of missing migrants live with every day. The testimonies were given to the ICRC in Zimbabwe in November 2017. In order to protect the families, their names have been omitted. Abstract: The tradition of providing refuge to people who are fleeing and in need of protection is a long-standing one, present throughout history and in various contexts, and now embedded in international law. The New York Declaration for Refugees and Migrants, adopted by the UN General Assembly in 2016, reaffirmed international refugee protection standards and provided a model for a more comprehensive response to large-scale refugee movements, based on shared global responsibility for refugees. It represented a critical development at a time when international cooperation aimed at preventing, responding to and resolving conflicts is proving inadequate, and an increasing number of people are being internally displaced, forced across borders or left in protracted exile as a result of conflict, violence and persecution. In this interview, the UN High Commissioner for Refugees shares his thoughts on some of today's most significant forced displacement challenges, and the prospects presented by the New York Declaration. 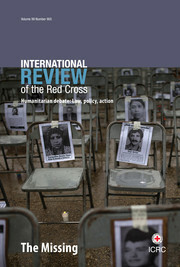 Abstract: Established in war, embedded in communities and operational in every major natural and man-made disaster, the International Red Cross and Red Crescent Movement (the Movement) – including 191 National Societies – is uniquely positioned to address the humanitarian needs of migrants at all points of their journey. With migration on the rise and an area of intense debate, this article examines the work of Australian Red Cross and the collective efforts of the International Federation of Red Cross Red and Red Crescent Societies, the International Committee of the Red Cross and the Asia Pacific Migration Network, particularly across 2015-17, to support the Movement in the region in providing assistance and protection to those who are most vulnerable. It considers the progress made so far, and the potential of the Movement to engage more effectively and collaboratively on opportunities and challenges into the future. Abstract: In 2016, thousands of young migrants were stranded in Calais, France, in the “Jungle” refugee camp. This paper aims to provide an overview of the British Red Cross's response and of how the organization engaged in numerous activities to secure their safety, culminating in a transfer of children to the United Kingdom. Abstract: The Honduran Red Cross began working in the area of migration in July 2012, when it set up the Migrant Assistance Module in Corinto for Honduran migrants returning over land at the Honduran–Guatemalan border. The Honduran Red Cross has helped hundreds of returning and irregular migrants, thanks to agreements with the Ministry of Foreign Affairs and the National Migration Institute. It has also worked with other National Red Cross Societies in the region, the International Federation of Red Cross and Red Crescent Societies and the International Committee of the Red Cross, which have helped it to strengthen its capacity and build a comprehensive vision for the protection and assistance of migrants. This article summarizes the action that the Honduran Red Cross has undertaken with respect to migration and explores the services provided at the Corinto module, the Honduran Red Cross's subsequent management of the Returning Migrant Assistance Centre in Omoa and other care centres for migrants returning because of their irregular status, and the development and implementation of projects on migration and related topics. Abstract: Now in its ninth year, the armed conflict in Nigeria has forced more than 2 million people from their homes, with more than 1.5 million of these displaced within the country. The regionalized conflict – which since 2013 has affected the neighbouring countries of Cameroon, Chad and Niger – has caused a protracted humanitarian crisis with some of the highest human costs in the world. The most affected area in Nigeria is the northeast of the country, primarily the States of Adamawa, Borno and Yobe. Abstract: This article aims at positioning the agency of the displaced within the longue durée, as it is exposed in contexts of hospitality and asylum, by articulating its key modes: contingent, willed and compelled. Using the ancient world as its starting point, the article exposes the duplicity in conceiving of the current condition of displacement as transient or exceptional. As such, it argues for the urgent need of a shift in the perception of displaced persons from that of impotent victims to potent agents, and to engage with the new forms of exceptional politics which their circumstances engender. Abstract: The vulnerability of migrants and the threats to which they are exposed during their journey, on land, at sea, or in countries where they have settled, raise serious humanitarian concerns that cannot be ignored. In view of the transregional nature of migration, the International Committee of the Red Cross (ICRC) and other components of the International Red Cross and Red Crescent Movement (the Movement) draw on their presence all along migration routes to contribute to the humanitarian response and alleviate the suffering of vulnerable migrants. The Movement's proximity to vulnerable migrants through its solid and experienced network of responders along migratory routes is one of its specific advantages. The aim of this article is to explain the ICRC's view on and approach to migration. It underlines that the ICRC's response is dictated by humanitarian needs, and stresses that these needs can be greatly reduced when States abide by their commitments under international law and adopt and implement policies that take into account the protection and assistance needs of migrants. It acknowledges the diverse and complex human realities behind migration and outlines the main protection and assistance concerns of migrants in countries and regions where the ICRC operates. Abstract: The movement of migrants across international borders may result in grave humanitarian consequences and protection and assistance needs for those involved. Although many reach their destinations safely, others may find themselves in a country experiencing armed conflict – either because they live there or are travelling through there – and may endure great difficulties and be particularly vulnerable. In these situations, as civilians, migrants are protected under international humanitarian law (IHL) against the effects of hostilities and when in the hands of a party to the conflict. This article will provide an overview of the protection afforded by IHL to migrants as civilians in international and non-international armed conflicts. It will then examine more closely certain particularly relevant rules for the issue of migration, notably those related to the movement of migrants, family unity, and missing and dead migrants. In this way, this article will show that IHL provides important legal protections for migrants finding themselves in situations of armed conflict. Abstract: This article provides an overview of the development of the International Federation of Red Cross and Red Crescent Societies’ (IFRC) approach to migration and displacement. The focus of the IFRC and its member National Red Cross and Red Crescent Societies (National Societies) in this regard has traditionally been on refugees and other so-called “displaced persons” – that is, people who have been compelled to flee their place or country of origin and for this reason are deemed to be particularly vulnerable. However, this focus has been extended recently, in the course of the past decade, to cover all people who find themselves in a vulnerable situation in the context of migration. The IFRC Migration Policy, which was adopted in 2009, has offered much-needed guidance to National Societies in dealing with all migrants, including irregular migrants. However, it is argued that there is a need today – taking into consideration the increasing number of displaced people worldwide and the numerous contexts in which National Societies are dealing with refugees, internally displaced persons or cross-border disaster-displaced persons – to better understand the programmatic aspects that are specific to displacement compared with migration. This is a necessary condition in view of the development of more adequate and effective responses to the vulnerabilities and needs of migrants and displaced persons. Abstract: This article considers the key data protection challenges facing humanitarian organizations providing assistance to refugees, internally displaced persons and migrants. These challenges are particularly significant for several reasons: because data protection has come relatively late to the humanitarian sector; because humanitarian organizations are under pressure to innovate rapidly; because the global communications architecture on which many of these innovations depend is inherently vulnerable to State surveillance; and because States are deploying increasingly sophisticated and coercive means to prevent irregular forms of migration and/or subjecting humanitarian organizations to surveillance and disruption. The first part of the article outlines the fundamental rights challenges presented by contemporary data-driven migration control paradigms. The second outlines concerns about “data-driven humanitarianism” and “mass surveillance” to show how humanitarian organizations risk inadvertently exacerbating these problems. The third assesses specific data protection challenges that humanitarian organizations face and the policies and practices they have developed in response. The article concludes with some brief observations on the technical and political dynamics shaping their efforts to comply with their legal and ethical obligations, and calls for the sector to work together to extend data protection norms and outlaw cyber-attacks by State actors. Abstract: A significant increase in the number of arrivals of refugees and migrants in Europe along the Western Balkans route brought several Balkan countries into the spotlight of international refugee protection in 2015 and 2016. Out of hundreds of thousands of refugees and migrants recorded entering the former Yugoslav Republic of Macedonia and Serbia, only a handful remained to seek asylum from their authorities. Under the circumstances, the applicability of the 1951 Refugee Convention with respect to refugees refraining from seeking asylum was brought into question, as well as the extent of transit countries’ legal obligations under refugee law. Based on the Western Balkans experience, the present article seeks to re-examine the relationship between the concept of asylum and the regime of the 1951 Refugee Convention, the Convention's scope of application in “transit countries”, and minimal standards stemming from positive law regarding the treatment of refugees and migrants in a transit context. Abstract: This article examines how the protection of migrants, refugees and internally displaced persons (IDPs) is spoken about and framed. Today it is evident that the dominant responses of sovereign States to each of these groups is heavily reliant on the language of security and (de)securitization, and this article openly conceptualizes ongoing attempts to protect migrants, refugees and IDPs as a series of overlapping (de)securitized “games”. At least three arguments follow from this claim. First, adopting this approach serves as a reminder that the ways in which different groups of people are spoken about often constitutes a dividing line between life and death. Second, the language games of (de)securitization are not identical when it comes to protecting different groups. Third, using securitization as the theoretical point of departure provides a timely reminder that none of the three categorizations listed above is guaranteed to apply. On the contrary, the adoption of each linguistic label – migrant, refugee, IDP – is subject to and dependent upon audience acceptance. Remembering the latter dimension is imperative to fully comprehend the ongoing contestations and countermoves in response to people moving in search of security. By way of conclusion, the article contends that far more attention must be paid to broader understandings of acceptance and love to ensure the protection of migrants, refugees and IDPs. Abstract: This article examines the value of the African Union Convention for the Protection and Assistance of Internally Displaced Persons in Africa (Kampala Convention) in the general quest for the regional and global protection of internally displaced persons (IDPs). It contends that the absence of a globally binding legal instrument for the protection of IDPs underlines the importance of the Kampala Convention and the possible contribution it can make to global and regional efforts to create a binding legal framework for the protection of IDPs. While recognizing some challenges that may impact the full implementation of the Convention, the article concludes by noting its various positive elements that are invaluable in overall efforts to create a comprehensive global legal framework to enhance protection of IDPs. Abstract: The world is rapidly urbanizing, and so is internal displacement. However, knowledge about the specific situation of internally displaced persons (IDPs) in urban settings and how it differs from, and impacts on, their host communities is still limited, and responses continue to be inadequate. This article analyzes the particular needs of urban IDPs by taking into account how the various contexts and patterns of urban internal displacement contribute to shaping people's experience. It discusses three key challenges that humanitarian actors are faced with in developing effective responses: identifying and reaching IDPs in urban settings, addressing their urgent protection concerns, and supporting their local integration. It concludes by pointing out the need for methodological and operational guidance on how to bring together area-based approaches that account for the impact of displacement on entire urban communities, and tailored approaches addressing IDPs’ specific needs in urban settings. The need for stocktaking exercises and more effective sharing of experiences among practitioners, municipal authorities and policy-makers is also underlined. Abstract: This article aims to acknowledge and articulate the notion of “humanitarian experimentation”. Whether through innovation or uncertain contexts, managing risk is a core component of the humanitarian initiative – but all risk is not created equal. There is a stark ethical and practical difference between managing risk and introducing it, which is mitigated in other fields through experimentation and regulation. This article identifies and historically contextualizes the concept of humanitarian experimentation, which is increasingly prescient, as a range of humanitarian subfields embark on projects of digitization and privatization. This trend is illustrated here through three contemporary examples of humanitarian innovations (biometrics, data modelling, cargo drones), with references to critical questions about adherence to the humanitarian “do no harm” imperative. This article outlines a broad taxonomy of harms, intended to serve as the starting point for a more comprehensive conversation about humanitarian action and the ethics of experimentation. Abstract: The International Committee of the Red Cross (ICRC) has worked on behalf of detained irregular migrants for many years as part of its activities for detainee populations in general, but has only recently started implementing specific programmes for detained migrants in countries of transit and destination. The ICRC visits detained migrants in both criminal and dedicated immigration detention facilities. During these visits, as with all detainees, the ICRC assesses whether detained migrants are treated humanely, held in conditions that preserve their dignity and afforded due process of law. The ICRC also evaluates whether they are able to maintain contact with the outside world, such as with their families and consular authorities, if they wish to do so. As part of its dialogue with the authorities, the ICRC also raises protection issues related to return to ensure that the authorities fulfil their obligations under relevant international law – in particular with respect to the principle of non-refoulement. Abstract: “Forced to Flee” was a multidisciplinary two-day conference on internal displacement, migration and refugee crises, jointly organized by SOAS University of London, the Arts and Humanities Research Council, the University of Exeter, the British Red Cross and the International Committee of the Red Cross (ICRC). It brought together some sixty researchers, independent and UK government policy-makers, and senior humanitarian practitioners. Abstract: In light of the growing complexity of humanitarian crises today and the continued need for effective cooperation among humanitarian actors, the International Committee of the Red Cross (ICRC) and the Office of the United Nations High Commissioner for Refugees (UNHCR) launched a consultative process in September 2016 to collect operational practices with regard to maintaining the civilian and humanitarian character of sites and settlements for internally displaced persons (IDPs) and refugees. Exchanges with field staff from both organizations targeted five ongoing operations – in the Central African Republic (CAR), the Democratic Republic of the Congo (DRC), Iraq, Nigeria and South Sudan – and included a one-day workshop in Geneva on 20 April 2017 in which the UN Department of Peacekeeping Operations (DPKO) also participated. A wider set of stakeholders was consulted as well, during a roundtable organized under the auspices of the Global Protection Cluster (GPC) on 21 April. Abstract: How Does Law Protect in War' Online is a platform adapted from the original reference Casebook published by the ICRC. It was originally intended to support teaching of international humanitarian law (IHL) in universities in an interactive way, based on contemporary practice. The section on “The Law” features a general outline presenting IHL in fourteen chapters. It contains comprehensive bibliographic resources and links each theme to a range of related case studies and documents. The section on “The Practice” comprises more than 300 case studies and documents regrouped by theme, region or type of document. They allow practice-oriented learning of IHL rules and interactive discussions through a series of questions. The “Pedagogical Resources” section provides useful advice on how to teach IHL, as well as twenty-nine model course outlines and other useful resources. The “A to Z” section presents 422 notions linked to IHL, their legal sources, the case studies where they are addressed, and bibliographic resources for delving further into those notions. A search engine allows users to find rapidly the relevant pedagogical material they need on the platform.